THE WILTSHIRE COUNCIL HEREBY GIVE NOTICE that on 10 August 2017, the following length of road shall be closed to all traffic in the interests of public safety to enable Wiltshire Council to carry out carriageway resurfacing work, road markings, ironworks and associated works. A338 (Part), Collingbourne Ducis / Collingbourne Kingston / Burbage; from its junction with Everleigh Road, Collingbourne Ducis in a northerly direction to its junction with B3087 Burbage Road, Burbage. Alternative route for HGVs: via A338 – A342 – A361 – A4 – A346 and vice versa. Alternative route for all other vehicles: via A338 – A342 – A345 – A4 – A346 and vice versa. The closure and diversion route will be clearly indicated by traffic signs and access will be maintained for residents and businesses throughout the works period. These works will commence on 10 August 2017 and are anticipated to be required for 1 night between 19.00 and 07.00. This Notice will have a maximum duration of 21 days. 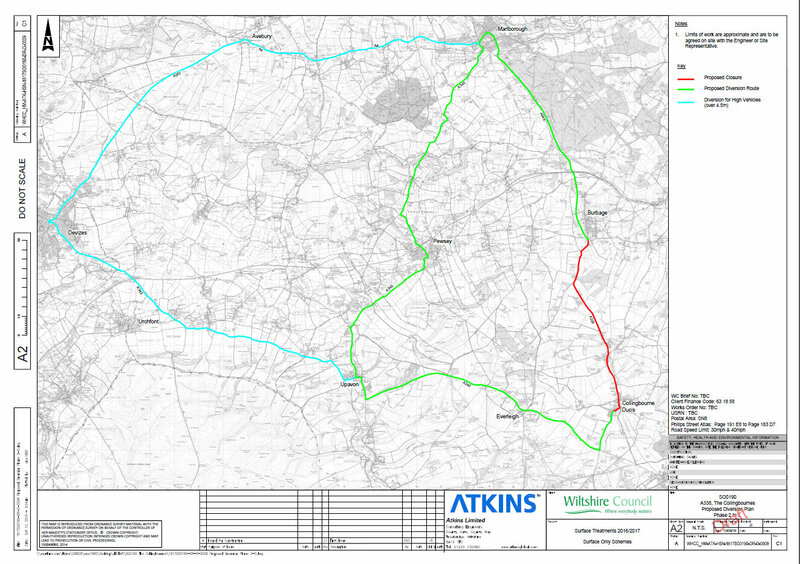 For further information regarding these works please contact Atkins on behalf of Wiltshire Council on 01225 730360.